Bring your kids to the San Francisco Presidio Civil War Lawn on Saturday, April 6, 2019 for a fun day of touching, honking, and sitting in over a dozen trucks and vehicles, making giant bubbles, and playing carnival-like games for prizes. Kids activities include a petting zoo, balloon animals, arts and crafts, and more! 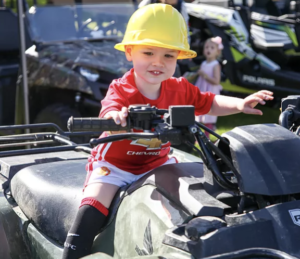 Not only is Touch-A-Truck® a fun and exciting activity for all Bay Area families, but proceeds from this fundraiser go to support our community partnerships and the Junior League of San Francisco (JLSF). All patron packages include VIP tickets with early admission at 9 am! General Admission begins at 10:30 am. “Early Bird” tickets do not grant early access to the event, they were offered at a discounted price for those that purchase tickets in advance online.